We've been growing the ponds we have in our backyard, yes they are increasing in number, if I'm not careful I may just turn around and find we are living in one giant pond. I never really gave these outdoor decorative ponds much thought, other than the fact that they look charming, sitting there amongst the gardens and I know that the birds love them so. Lately though I've been thinking more about them as I have noticed how much the children gravitate towards the pond and the creatures that live within and around the ponds. 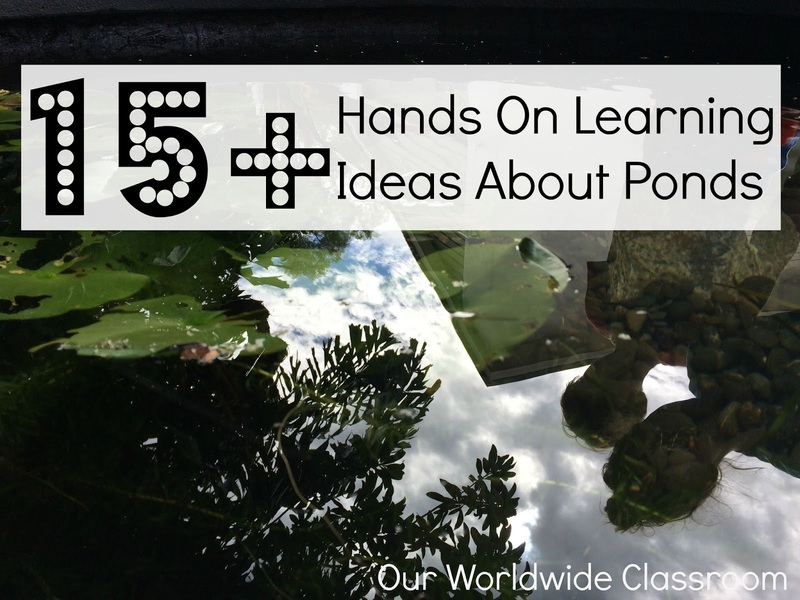 I was pleasantly surprised to realise just how much learning happens with our little backyard pond. In fact I easily compiled a list of 15+ ways in which the kids have been undergoing self directed learning in and around the ponds. 1/. Reflections: Depending on the time of day and exactly where the sun is in the sky, the pond water provides the perfect playground for looking at reflections. This has provided endless fun and laughter and they now know they need to time their reflection play to coincide with the sun. 2/. Ecosystems: What better way to see an ecosystem at work, in all weathers and all seasons than with a pond in the backyard. We have in the past covered ecosystems in a more formal way, but having the opportunity to witness one in action on a daily basis is a fabulous asset. 3/. Life Cycles: we've observed and discussed on many occasions the Frog Life Cycle with our tadpoles. Looking on in wonder, admiring their metamorphosis. We've discussed the various stages and have witnessed each stage for ourselves. 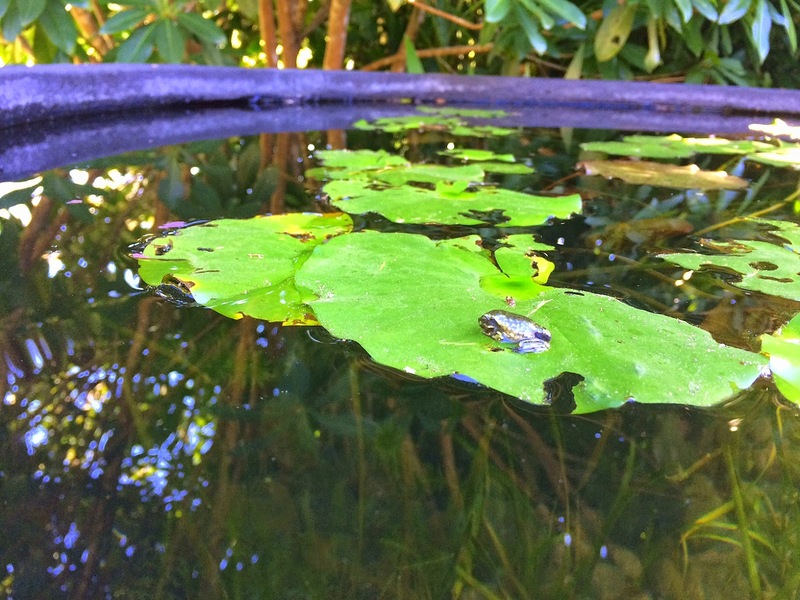 Including the wonderful opportunity to admire gorgeous tiny frogs resting on the lillypads. 4/. Plant Life: One simply cannot own a pond without having plants to grow in them. This of course has led to much research on the best plants and in particular lilly's for the newer larger pond. Here they have rescued some lilly's that were on the brink of death from being eating by something. Very quickly they began to sprout fresh new leaves and the children were able to see how important the entire mini ecosystem is to each living thing within it. 5/. Fish Care & 6/. Aquarium Visits: There have been several visits to our local aquarium pet store. The possibilities for fish are endless, but because this is an outdoor pond the children have needed to understand the requirements of the fish and the reasons why they can keep some here in the pond, like Australian native fish and why they simply cannot have a Nemo fish in their outdoor pond. We've had fish not survive and have had to speculate on the reasons why and make better choices when purchasing new fish. 7/. Feeding: With a new pond there isn't generally enough fodder around and so they require feeding, this has been the responsibility of the children also and in particular our six year old. 8/. Pond Care: This is an important learning experience when owning a pond. Whilst they mostly look after themselves from time to time they require some cleaning, here my six year old is helping his dad to move some of the fish into the new larger pond and to give this smaller one a clean. They had been stirring the water up and moving the rocks around considerably so the water is quite murky looking in this photo. 9/. Mosquito Larvae: Where there is water there is often mosquitoes and mosquito larvae. However this provides some very yummy food for our pond inhabitants. 10/. 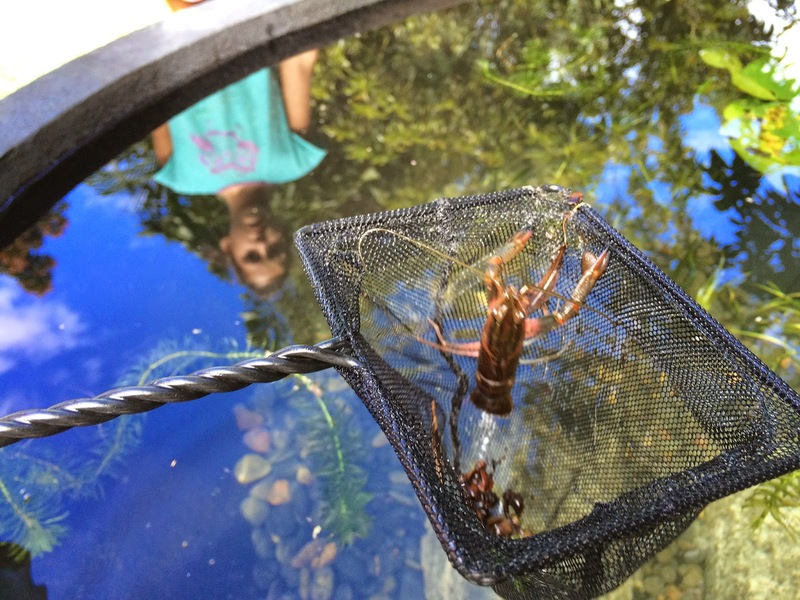 Crustaceans: The kids absolutely love having freshwater yabbies in the pond, although they hide very well and we don't often get to see them, everyone was in awe at how much this guy had grown. He obviously loves it in there. 11/. Reptiles: We are fortunate enough to have quite a large garden where the pond is nestled, therefore several critters live within those gardens that surround the ponds. Not only are lizards a common occurrence but we also have at least one resident green tree snake that has made his home right here in this garden. 12/. Birds: Wherever you supply bodies of water birds will come. They particularly love this smaller bird pond and most days can be found sploshing and splashing about. 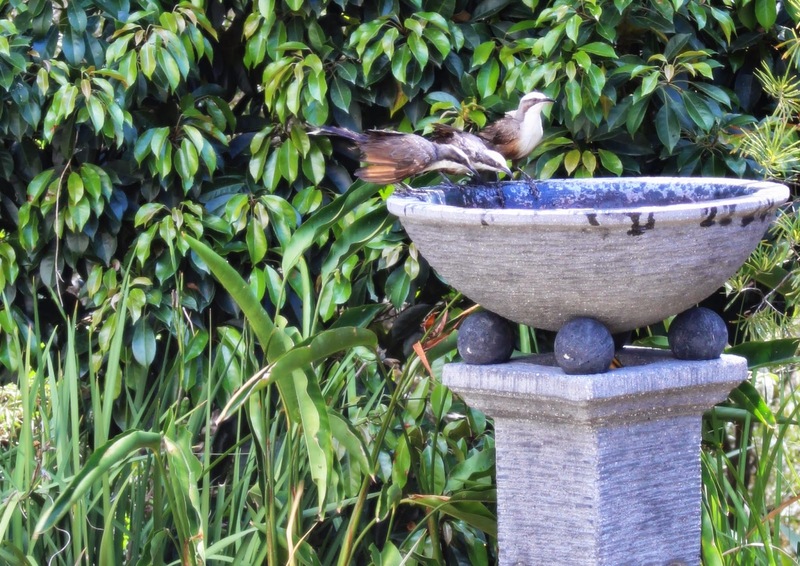 We can easily view this particular water feature from our windows and front door, so it makes for a great spot to view the birds and get to know them a little better. 13/. Bird Feeders: Of course no garden and pond are complete with the addition of a bird feeder or two. We have some permanent feeders and have also tried our hand at making our own bird feeders. This is what I can see from our office window as I type. There is almost always a constant gathering of birds hanging around the pond. 14/. Self Reflection: Daily each and every one of the children can be seen completely mesmerised by the allure of the pond water. It is so tranquil and provides the perfect space for some quiet meditative time. The best part is that this happens completely naturally, no one is playing meditation discs or asking everyone to gather for some quiet self reflection time. Simply walking by the pond gently invites and encourages you to do that almost immediately and without thought. 15/. Art: We decided to sketch and paint the pond and surrounding garden area. Our term focus with our art lessons has been on Impressionism and this was such an obvious choice for us to recreate this scene. 16/. 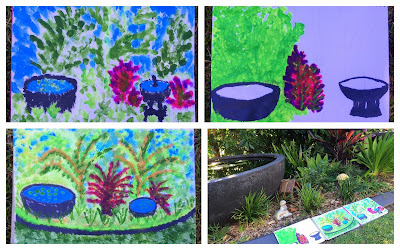 Nature Journals: We have added several pages to our nature journals this year and I am sure that the ponds will continue to be a source of inspiration for more backyard nature journalling in the future. 17/. 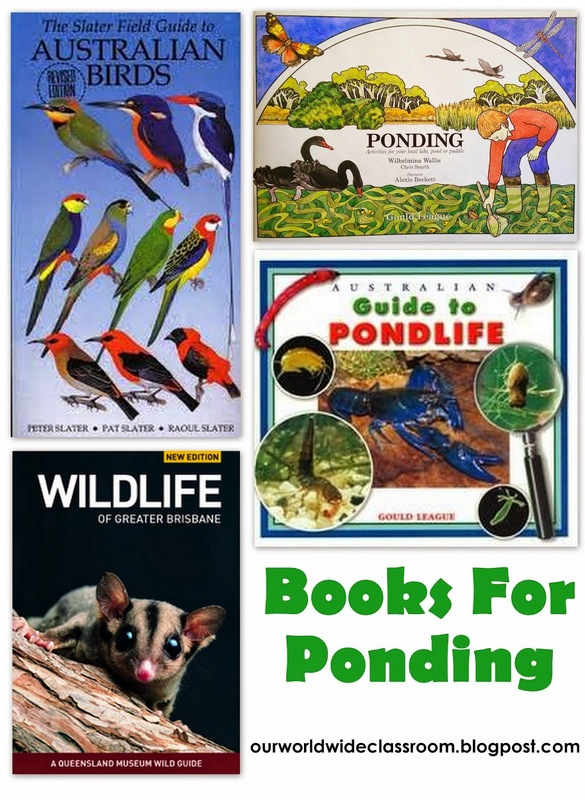 Books: We own and use just a small smattering of books related to the pond. Each of these have been invaluable in assisting us to learn more about our ponds and the wildlife that live within and around the pond. 18/. 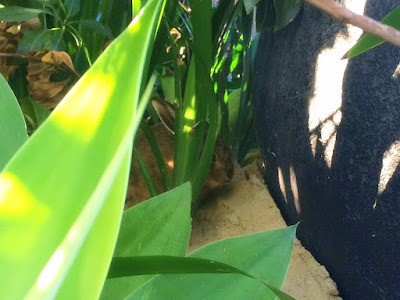 Critters: We even have a few naughty bunnies living in our gardens that surround the pond. This guy has been so very brave and on several occasions we have watched him in broad daylight out munching the grass near the pond. The kids have tried so hard to catch him but of course no such luck. I think we are pretty lucky to even get this little glimpse of him on the camera. 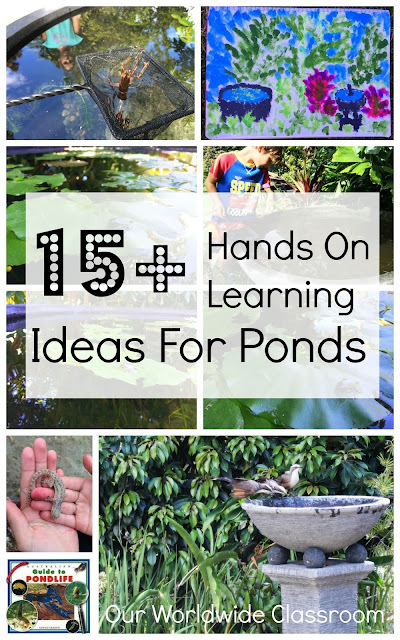 Who would've thought that there were so many learning opportunities from simply owning a backyard pond. Do you have a backyard pond? 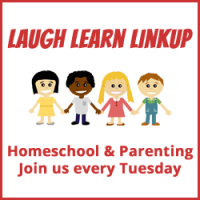 Does it also provide your children with endless hours of learning opportunities? Follow Kylie @ Our Worldwide Classroom's board Themes - Pond Life on Pinterest. 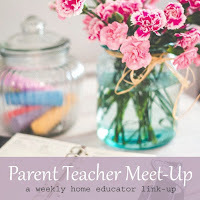 Yes I was so surprised Tiziana when I rreally thought about all of the natural learning simply happening before my eyes. Have fun bird bath hunting! I absolutely love this post, and had to laugh at the "We can't keep Nemo in our pond." Very true.